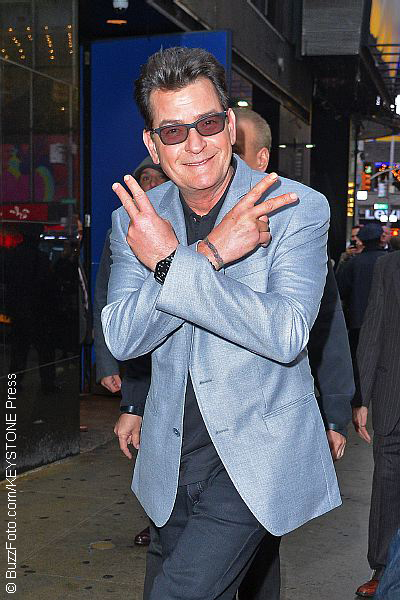 Charlie Sheen is claiming to know which other Hollywood A-listers are HIV-positive, but is vowing to keep that information private. On Wednesday (March 22), the Golden Globe-winner was featured on The Kyle & Jackie O Show — an Australian breakfast radio program — and candidly discussed his own battle with HIV. Then, when Jackie opened the topic and asked Charlie if there are other stars who are HIV-positive but “wouldn’t dare come out and say it” as he has, the Two and a Half Men actor made an admission. Charlie then turned the conversation to “the miracle drug” he’s taking to keep healthy. The Anger Management actor announced his HIV-positive status in November 2015. Aside from their questions about the disease, Kyle and Jackie also inquired about whether any of Charlie’s friends had ever tried to sell him on Scientology. Once John’s name was mentioned, the hosts asked what Charlie’s thoughts were on John’s sexuality. Rumors have spread in the past that John is gay and that he sexually assaulted a masseur. The video, however, was never shot. I like that he said his rule about not being there, so don’t talk about it. Well, if others are HIV positive, even thought you don’t spread their names, you added a spark to create a fire, now media will be all over speculating who’s HIV+ and who’s not. Yeah, this is just his way of inserting his name in the conversation. We haven’t heard from/about him in a while and now he misses the spotlight. It’s an attention grab and I think it’s pretty shallow. I’d be surprised if he even knows which other celebrities are HIV+. It’s a no brainer….it’s not his place to reveal that kind of information. Keep your beak shut Charlie!! The interviewers obviously did no research before the interview. They just asked off the cuff questions looking to create fluff or a soundbite. That’s the kind of show it was. That’s fine but they shouldn’t be asking anyone to divulge info about whether someone else has AIDS or if he thinks they are homosexual or not. They had nothing intelligent to ask and most of this sadly has been asked of him before. I believe it’s illegal to reveal that information anyways; if he said anything he’d have some hefty lawsuits to deal with, especially since it’s hollywood stars. After this article, and after reading first parts of two more underneath this one, (didn’t open rest of each), Charlie should have his talent shine, not his bad boy antics. But…either he is singled out for that, or he IS that way. The title attracted my attention. It was the most interesting article, unfortunately. But should be private. I guess when we know more about celebrities, we feel a bit more like they are regular people. I feel sorry for anyone getting involved on a personal level with Charlie. Especially Denise Richards.